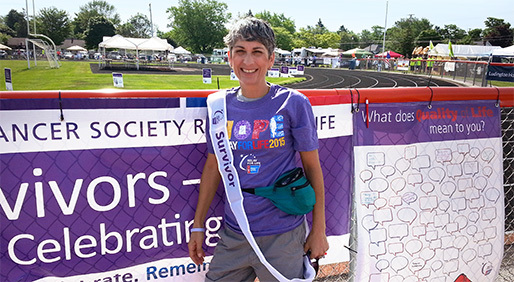 After a painful lump in her left pelvis drove Laurel Felsenfeld to see a string of specialists in 2012, she was diagnosed with a high-grade, malignant soft tissue sarcoma. But because her cancer was described as “unclassified” or “dedifferentiated” — four separate opinions led to four different diagnoses — the nurse case manager from Detroit is living with the uneasiness of not knowing exactly what disease she has and whether it will come back. Felsenfeld says that a regimen of herbs, counseling with a cancer coach and interacting with other patients on Inspire, an online discussion forum, have helped her cope with this reality — and a lifetime of CT or MRI scans every six months. Soft tissue sarcoma is often referred to as one disease, but it’s far from that. In fact, it’s a group of cancers that includes at least 50 different tumor types, some of which are so rare they only affect a handful of patients in the U.S. per year. But they do have some things in common — not just that they start in the body’s connective tissues, but that they are benefiting from scientists’ rapidly advancing ability to sequence their genetic makeup. Although surgery, radiation and chemotherapy have long been the go-to strategies for soft tissue sarcoma, advancing insights into the genome are changing the way the scientific community is approaching this group of diseases and opening up prospects for finding new, more effective treatments. Even as a group, soft tissue sarcomas are rare. About 12,000 soft tissue sarcomas are diagnosed each year in the U.S., and nearly 5,000 patients will die from these cancers, according to the American Cancer Society. They can occur in any tissue of the body that isn’t bone, and they are most common in the arms and legs. Risk factors include radiation to treat a previous cancer; some inherited family syndromes; damage to the lymph system, such as lymphedema; and exposure to certain chemicals. Soft tissue sarcomas are often diagnosed after the patient notices a growing lump somewhere on the body, but other signs can include abdominal pain or blood in the stool. The three most prevalent soft tissue sarcomas are undifferentiated pleomorphic sarcoma, which often appears in the thigh; liposarcoma, which typically arises in the thigh or abdominal cavity; and leiomyosarcoma, which most commonly grows in the uterus. Overall, the five-year survival rate of people with soft tissue sarcomas is 50 percent, and numbers are similar for those with sarcomas that have spread regionally; the survival rate jumps to 83 percent for those with localized sarcomas (more than half of patients at diagnosis) but drops to 16 percent for those with distant metastases, according to the American Cancer Society. Most soft tissue sarcomas are treated with a combination of surgery, radiation and chemotherapy, with the exact regimen contingent on such factors as how accessible the tumors are to surgeons, their size and whether or not they have metastasized. Adriamycin (doxorubicin) and Ifex (ifosfamide) are the most commonly used chemotherapy drugs, says H. Thomas Temple, senior vice president for translational research and economic development and professor of orthopedic surgery at Nova Southeastern University, in Florida. But this regimen is controversial, he says, because many oncologists question whether the harsh side effects of chemotherapy outweigh the benefits in these diseases. Side effects with this regimen can include increased infection risk, headache, achy muscles, fatigue, nausea or vomiting, hair loss and mouth sores. More serious side effects can include liver or heart damage. One therapeutic technique that has gained ground in recent years is to cut off the blood supply to sarcomas after they’ve been treated with chemotherapy, in the hopes of shrinking the tumors even more so they can be removed with surgery. In 2012, the U.S. Food & Drug Administration approved Votrient (pazopanib) — which works by this mechanism, known as “anti-angiogenesis” — to treat soft tissue sarcoma that has progressed on chemotherapy. In a study of patients who had previously undergone chemotherapy, Votrient extended the period in which the tumors did not grow from 1.6 months to 4.6 months. Common side effects included mild nausea or vomiting, changes in hair or skin color, and joint or muscle pain. It was the first new drug approved to treat soft tissue sarcoma in decades, raising hopes in the oncology community that further advances may be on the way. Oncologists who treat soft tissue sarcomas are hopeful that genomic research will unlock new targets for treatments that can be directed at even the very rare forms of the condition. That already happened with one type of cancer called gastrointestinal stromal tumor (GIST), which used to be considered a soft tissue sarcoma but is no longer because of a key discovery about its biology. About 85 percent of GISTs, which affect more than 3,300 Americans per year and usually appear in the stomach or intestines, carry a mutation in a gene called KIT, according to the National Cancer Institute. There are now drugs on the market that target that mutation, including Gleevec (imatinib) and Sutent (sunitinib), both of which have extended survival times for patients with this tumor type. Some soft tissue sarcomas include mutations that silence protein expression in genes called INI-1 and SMARCA4, and those abnormalities may be promising targets for new therapies. One experimental drug called EZH6348 (tazemetostat), which can help reverse that aberrant process, is now in midstage trials in patients with rhabdoid tumors and relapsed synovial sarcomas. An early-stage trial whose results were reported in September showed that the drug was active in a broader group of patients than initially expected, and was generally well-tolerated as a solo treatment, with mild side effects. Another protein active in some types of soft tissue sarcomas is called colony stimulating factor 1 receptor (CSF-1R). The already approved leukemia drug Tasigna (nilotinib) inhibits CSF-1R, along with other targets, and is now being tested in a variety of soft tissue sarcomas. One trial, which is now recruiting patients, will combine the drug with chemotherapy in some patients with liposarcomas and leiomyosarcomas. Side effects can include skin rash, nausea and fatigue. And another CSF-1R inhibiting drug called pexidartinib is in phase 3 trials to treat patients with a type of sarcoma called tenosynovial giant cell tumor (TGCT). In November 2015, the FDA granted breakthrough designation to pexidartinib in patients with this tumor type, which could help speed the drug to review by the agency, and then potentially to market. The FDA’s decision was based on a small, early trial in which 52 percent of patients showed a partial response to the drug and 83 percent had stable disease while taking it. Side effects were minor and included fatigue, changes in hair color, swelling around the eyes and stomach upset. Other targeted drugs that may prove useful in soft tissue sarcoma are designed to block an enzyme called poly ADP ribose polymerase (PARP), upon which some cancers rely so they can repair their own DNA and continue proliferating. Inhibiting PARP seems to enhance the ability of chemotherapy to do its job. Now AstraZeneca, maker of the PARP inhibitor Lynparza (olaparib), which is approved to treat ovarian cancer, is recruiting patients with advanced sarcomas to test the drug in mid-stage trials. In one of those trials, Lynparza will be given along with Yondelis (trabectedin), a drug that was originally derived from sea squirts. The FDA approved Yondelis in October 2015 to treat liposarcoma and leiomyosarcoma. No one is quite sure why Yondelis has anti-cancer properties, but oncologists are heartened by the increasing interest in the research community to look for new treatments for rare sarcomas off the beaten path — and to combine them with other emerging therapies to help improve patients’ prognoses. Another drug derived from marine life, Halaven (eribulin), was approved by the FDA in January 2016 to treat liposarcoma that had already been treated with anthracycline chemotherapy and could not be surgically removed. In a trial, patients who took Halaven lived an average of 15.6 months compared with 8.4 months for patients who instead took dacarbazine chemotherapy. Side effects included fatigue, hair loss, nausea, diarrhea, joint pain, fever or peripheral neuropathy. Halaven can also compromise the ability to fight infection. Lynparza and Yondelis can each cause fatigue, nausea and vomiting. Lynparza can also cause anemia and a distorted sense of taste. Yondelis can cause swelling of the hands and feet. Control of the cycle that governs cell division can be altered in many cancers, and with that aim, a class of drugs called cyclindependent kinase (CDK) inhibitors, including Ibrance (palbociclib), which is approved for breast cancer, are being assessed for soft tissue sarcomas. Drugs that inhibit immune “checkpoints” and free up the immune system to attack cancer have greatly improved the prognosis for some patients with melanoma and lung cancer — and sparked hope that the same science can be applied to other tumor types. In soft tissue sarcoma, there are trials underway of two approved drugs that inhibit the checkpoint PD-1: Keytruda (pembrolizumab) and Opdivo (nivolumab). In one small trial of Opdivo whose results were presented at the American Society of Clinical Oncology (ASCO) annual meeting in April 2016, nine out of 14 evaluable patients with sarcoma showed some clinical benefit. A larger phase 2 trial of Keytruda in patients with several types of soft tissue sarcoma produced a 22 percent response rate in undifferentiated pleomorphic sarcoma, though other tumor types didn’t respond. That trial, called SARC028, is ongoing but no longer recruiting participants. Some trials of PD-1 inhibitors are investigating whether combination treatments might help patients whose cancers have spread and can’t be effectively treated with surgery. One trial, which is now recruiting patients, is testing a combination of Keytruda and various types of chemotherapy, while another is combining Opdivo with Yervoy (ipilimumab), a drug that inhibits another checkpoint called CTLA-4. (Enrollment in that trial was suspended after it reached its limit in 2016.) Rash is a common side effect of immune checkpoint inhibitors, and a colitis-like condition with diarrhea can also occur, as can hormonal problems and liver inflammation. Oncologists who treat sarcoma are watching these trials carefully to determine what role immunotherapy should play in the treatment of their patients. “Although it’s not likely to benefit every sarcoma patient, immunotherapy will have an impact,” predicts Crystal Mackall, professor and associate director of the Stanford Cancer Institute. Mackall is a lead investigator for a new experimental treatment called NY-ESO-1 TCR, which uses patients’ own immune cells to attack their tumors. The cells, known as T cells, are removed from patients and then engineered to recognize the protein NY-ESO-1, which is prevalent in several tumors, including synovial sarcoma. Then the cells are infused back into the patients. The FDA granted the treatment breakthrough status in February 2016 based on early results from an ongoing phase 1/2 trial showing a 60 percent response rate in 12 patients with synovial sarcoma. Side effects included nausea, anemia, fever and reduced lymphocytes and/or neutrophils in the blood. A systemic inflammatory response known as cytokine release syndrome is also possible. For many patients with soft tissue sarcoma, surgery with or without radiation can be the key to controlling, or even eliminating, the disease. “Techniques have improved, so surgeons can take out structures and tissues that previously may have been difficult,” says Shreyaskumar Patel, a professor of medicine and medical director of the sarcoma center at MD Anderson Cancer Center, in Houston. Combining surgery with precise radiation targeted at the tumor can even help some patients whose disease has advanced to stage 3, he says. For Felsenfeld, the patient from Detroit, a complicated, imageguided surgery performed shortly after her diagnosis went a long way toward getting her cancer to the point where it can no longer be seen with standard imaging tests. During the surgery, she said, the tumor had to be peeled off nerves carefully, so as not to sever anything that would cause her to lose feeling or function in her leg. Shortly after the surgery, Felsenfeld, now 53, returned painfree to her favorite hobbies of hiking and biking. She had a second surgery in 2015 to relieve residual pain and numbness and has MRI or CT scans every six months to check for any recurrence of the cancer. Felsenfeld is fortunate that her sarcoma has been controlled without chemotherapy, but for many patients, that’s not the case. That’s why some researchers are looking at a host of methods for improving chemotherapy. For patients with Ewing sarcoma, a tumor type that can occur in either soft tissue or bone, for example, changing the timing of chemotherapy has made a world of difference. In one large trial in the late 2000s, patients with Ewing sarcoma who received alternating cycles of two chemotherapy regimens every two weeks had a three-year event-free survival rate (survival without disease progression) of 76 percent, while patients who received the same alternating treatment every three weeks — which had been the standard of care — had a three-year event-free survival rate of just 65 percent. Toxicities were no worse with the denser dose. As a result, the standard of care changed, and those drugs are now given every two weeks. Another way scientists are trying to improve upon existing chemotherapy regimens is by designing “analogs,” reengineered versions of traditional drugs that are better able to target tumors and that cause fewer toxic side effects. In January, Gem Pharmaceuticals’ analog of doxorubicin, called GPX-150, received orphan drug designation from the FDA, another classification that, like breakthrough status, can shorten development timelines. The drug, which is in an ongoing phase 2 trial for adult soft tissue sarcoma, was re-engineered to lessen the risk of cardiovascular side effects — a known problem with high doses of doxorubicin. In June, Gem released preliminary data from the trial that showed that tumors stabilized in nine out of 22 patients, and that none of them experienced any difference in heart function or adverse cardiovascular side effects. Still, not all trials of chemotherapy analogs have been successful. An early trial of aldoxorubicin, an analog of doxorubicin being developed by CytRx, showed a 25 percent response rate in patients with soft tissue sarcoma, whereas none of the patients on doxorubicin responded. Aldoxorubicin uses a “linker” molecule to bind to the blood protein albumin, which in turn allows it to carry the medicine directly into tumors, while sparing healthy tissues. But in July 2016, CytRx announced that in a phase 3 trial, there was no significant difference in progression-free survival among patients taking aldoxorubicin and those on traditional treatments. However, there was a near-doubling of overall response rate and disease control rate (a combination of overall response rate and stable disease) among the patients evaluated. CytRx expects to release more detailed data by the end of the year.